September 11, 2018 at 7:47 pm. “I just want to win games,” Notre Dame coach Brian Kelly said. “I’ve never been about style points, what they look like, as much as trying to find a way to win a game. I think my entire career has been about if we need to run the football here, even though more points would be better, I don’t want to put us in a position where we could jeopardize winning the football game. Vanderbilt (2-0) would love to spoil Notre Dame’s successful September. The Commodores are coming off back-to-back, lopsided victories over Middle Tennessee and Nevada as they look to go 3-0 for the second year in a row. That might be easier said than done against Notre Dame’s defense, which has proved to be the strength of the team so far. After giving up an 85-yard scoring drive against Ball State on the Cardinals’ first offensive possession, the Fighting Irish allowed only 36 total yards on the next 19 plays. 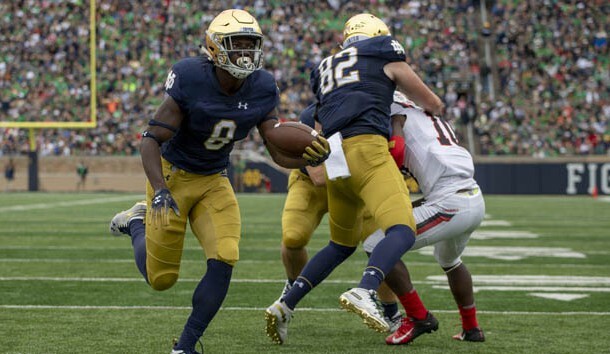 Notre Dame has forced eight three-and-outs on 27 defensive series – an impressive 29.6 percent success rate – heading into the third week. Linebacker Te’Von Coney is coming off a 14-tackle performance and leads the team with 24 stops, while linebacker Drue Tranquill and safety Alohi Gilman are tied for second with 16 tackles apiece. “I think second-level support has been much better,” Kelly said. “It starts with better tackling at the second level. Drue and Te’von are really good linebackers, as well. A very conscientious group up front. I don’t think you just say the safeties are tackling better. You look at all three levels. All of them have to be part of that. Vanderbilt’s leader is senior quarterback Kyle Shurmur, whose 44 career touchdown passes rank second in school history to Jay Cutler (59). Shurmur has four games with at least 300 yards passing and is No. 5 on the school’s all-time list with 6,163 passing yards. The Commodores’ defense will rely heavily upon LaDarius Wiley, a safety who returned to the starting lineup last week after missing most of the season opener because of a targeting penalty. Wiley led the team with 88 tackles a year ago and posted five tackles against Nevada.